These ingredients should be the three most commonly found in Chinese grocery store. 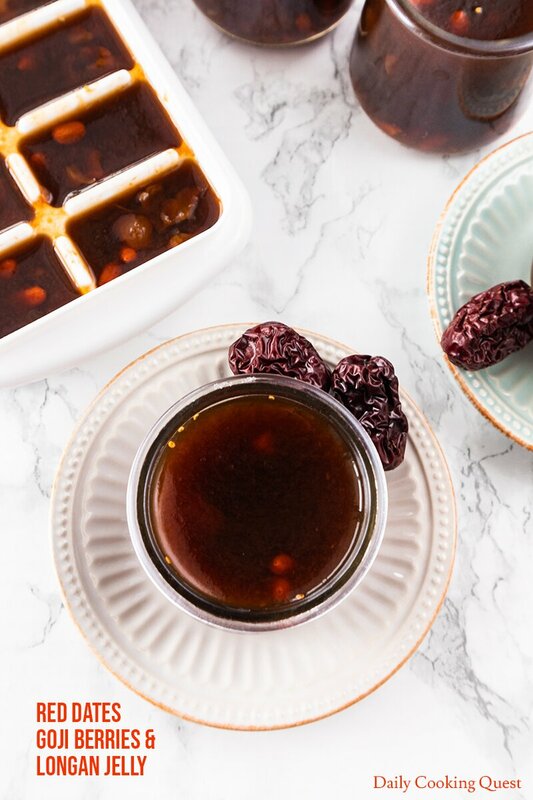 Red dates (jujube) are also very common in Korean cuisine, so you may be able to find this if you are close to a Korean grocery store. Goji berries are getting mainstream lately, I have even spotted them in my regular grocery. As for longan, it is best if you can get the dried version and then rehydrate. But if your only option is the canned version, that should also work, but your jelly will probably be less dark red compared to mine. 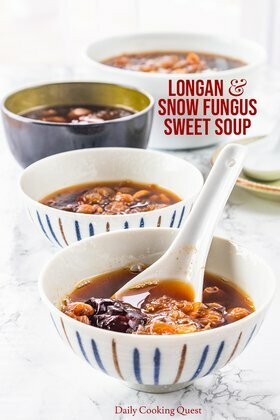 Plus, I actually prefer the taste of rehydrated longan in this dessert (and many Chinese herbal soups) compared to the canned version. Swallow Brand “Kristal Agar” 10 gram packet (and it says agar-agar & jelly powder), this is not the same as the Swallow Brand 7 gram packet of agar-agar powder (notice the lack of “jelly” in the 7 gram packet). 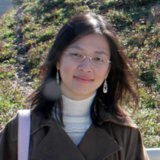 You can get more detail from Swallow Globe site to scrutinize the difference so you don’t get the wrong one. Now real food agar powder. Again, you need 10 gram of the powder for this recipe. With konnyaku jelly powder, I get a slightly chewy jelly. With agar powder, I get a cleaner crispier texture for my jelly. What you like depends on your personal preference. Taste wise, they are both the same. And regardless of choice, you still end up with a vegan friendly dessert. With this recipe, you will end up with about 4.5-5 cups worth of liquid plus the solid herbs. The easiest and fuss free option is to pour into an 8-inch square pan, let it solidify, and then cut into serving sizes just like a cake. 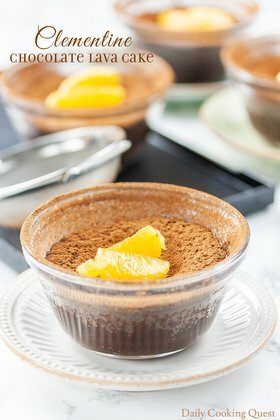 Or, you can also pour them into individual serving ramekins or pretty ceramic glasses/bowls, let it solidify, and so you can serve them directly without unmolding. Originally published on September 14, 2013. 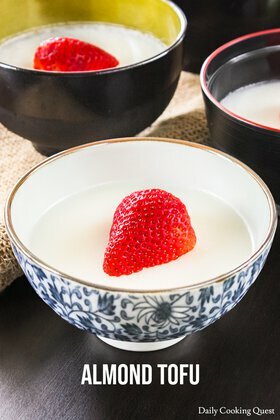 Updated on February 6, 2019 with new photos, an updated method to get that deep ruby red color in the jelly, and two options to create the jelly (konnyaku jelly powder, and agar powder). 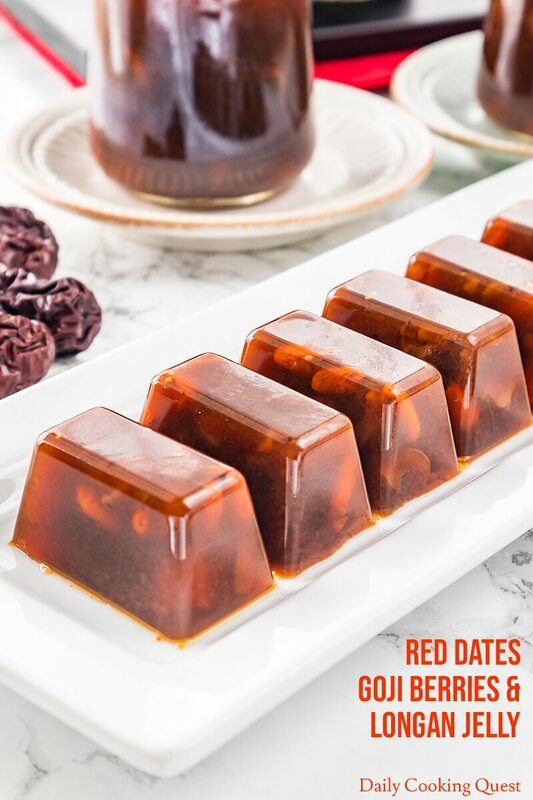 Cut red dates into pieces and place in a sauce pot along with pandan leaves. Strain and set aside the rehydrated longan, but retain the 1.5 cup soaking water. Pour longan soaking water + 3.5 cup cold water to the pot. Bring the pot to a boil. Reduce heat to a simmer, cover, and cook until the red dates are very soft and breaking apart. About 30-45 minutes. Strain to get the liquid, pressing with a spoon to get as much of the red dates meat as possible. Discard the pandan leaves and red dates seeds and skin. Return the strained liquid to the sauce pot. You should get 4 cups of liquid. If you end up with less then this, top with cold water to bring it to 4 cups. Add longan to the sauce pot. Boil, cover, and simmer again for 15 minutes. Add goji berries and simmer for another 5 minutes. 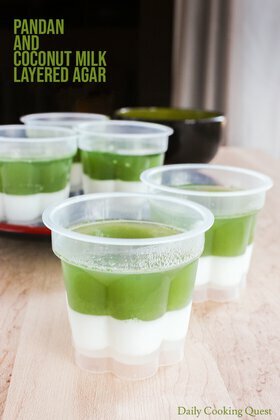 Mix agar powder (or konnyaku jelly powder) and sugar together. Add this into the liquid and boil for 5 minutes, keep stirring until all the powder and sugar have completely dissolved. Pour into a mold (or several molds, any kind of mold can be used). Set aside to cool, then refrigerate until firm. Serve chilled. 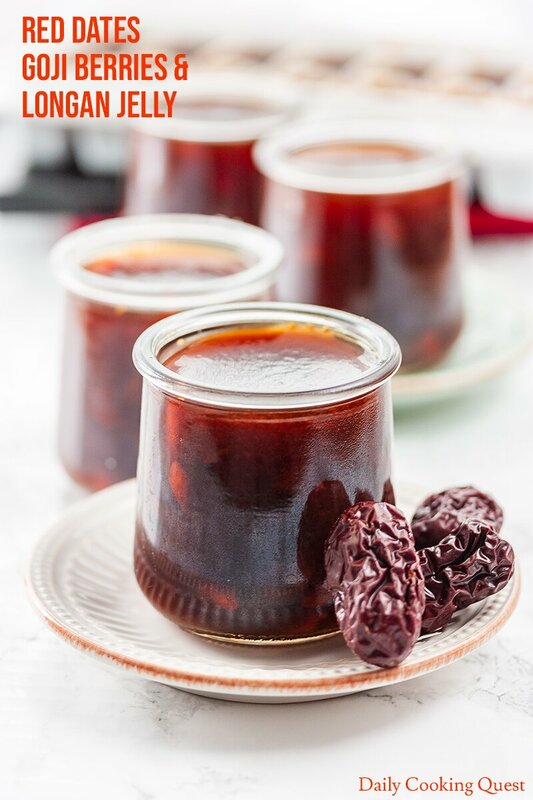 (*) You can also use canned longan. You will need 100 gram of the canned longan, but none of the liquid. And you will need to add 5 cups of cold water when boiling the red dates in step 1. If you choose this option, your jelly will be less red compared to using rehydrated dried longan. Hi, Could you please tell me where to buy red dates, snow fungus in Jakarta Selatan? Thank you. Hi Candice, I rarely venture to Jakarta Selatan. But since most Chinese descendants congregate around North and West Jakarta, it is more likely to find Chinese herbs in these places. 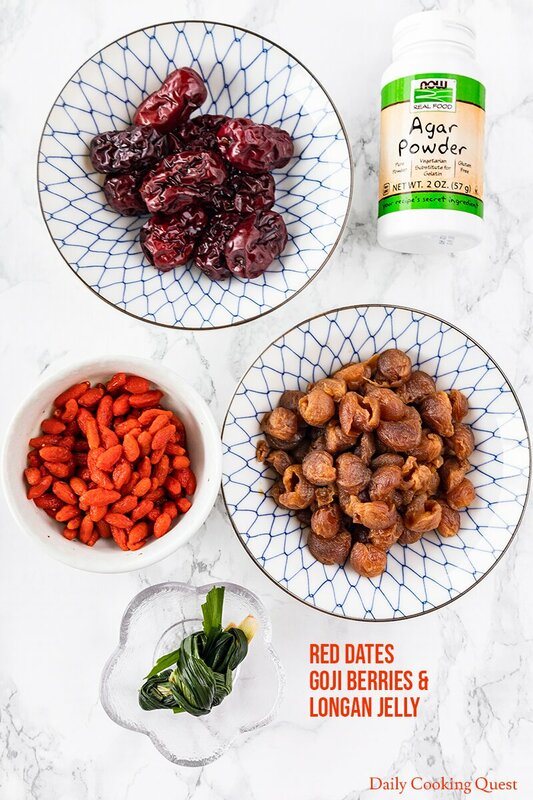 In fact, even big supermarkets like Carrefour, Hero, and such in Pluit, Kelapa Gading, and Tanjung Duren regularly have red dates and snow fungus. Can add some chrysanthemum in!!! Great idea! Chrysanthemum would definitely work with this, but you may probably want to remove the flowers from the jelly. Goji berries is full of antioxidant and provide the much needed minerals for our eyes.